This time I’m welcoming Stephen Avery. Stephen is the co-designer of Nothing Personal, the game about gangsters and becoming the Boss of Bosses. Tom: Welcome Stephen. Thanks for joining me on Go Forth. Stephen: Hi Tom, Thank for the opportunity to promote Nothing Personal. What do you want to tell us about yourself? Stephen: I put fun first. Life is too short. Tom: I’m alway interested to hear what other gamers do for a living. How do you support your gaming habit? Stephen: I am an elementary school art teacher. It is poetic justice since I was a terror at school that I would be sentenced to be a school teacher for most of my adult life. But I really do love working with kids and seeing their creativity blossom. Tom: Wow, that’s impressive. And probably pretty rewarding too. Neat. Stephen: It is tremendously rewarding. Stephen: At the age of 8 I went over to my best friend’s house and played Dungeons and Dragons with his older siblings who were back from college. I was hooked. I have been playing ever since. About 10 years ago I was between gaming groups and met Frank Branham. His penchant for wacky adventure games hooked me into board games. It wasn’t long before I was playing board games more often than RPGS. Tom: Yeah, D&D seems to have been our generation’s gateway game. I still have most of my old D&D stuff. I’m thinking of running a quick campaign with it next. Do you have any memorable campaigns or adventures you can tell us about? Do you still rpg? Stephen: I still get together with my freinds once a week. I still geek out a little bit whenever something iconic happens…like slaying a dragon in a tough fight or dueling on a gangplank. 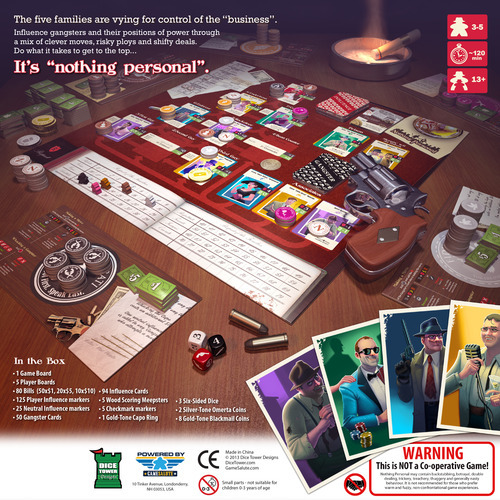 Stephen: In Nothing Personal, the players are criminal overlords trying to gain the most respect by controlling the mafia. Every turn players play cards to take control of various types of gangsters. The cards also force you to aid or hinder other players so the game becomes a set deals and alliances that shift as the power structure changes. The control shifts quickly and gangsters may end up getting shot, arrested, or lose status and stronger gangsters work their way up the chain of power. I was pleased that we were able to include many elements that you hope and expect to show up in a gangster themed game like blackmail and omerta. Also the quality of the components blew me away. It looks fantastic. Tom: I unfortunately didn’t get to play it this year at TBGT but I think one of my local group has a copy. I’ve heard good things about it. People talk about the social aspect of it. On that topic, how social, meaning the players interact a lot, does a game need to be? Outside of party games, which are ultimately social, what games really hit that mark in your opinion? Stephen: It is completely a social game in the same vein as Cosmic Encounter. You can try to win CE without wheeling and dealing but you’ll not win that way…and more importantly you miss out on a rich experience that the metagame provides. Social oriented games are amongst my favorites: I’m the Boss, Lifeboat, War on Terror, and actually a lot of Co op games because communication is integral to playing them. Tom: Viva Java is like that. You have to be social to make it work. Do you have a favorite design element/mechanic? Stephen: I think theme first and choose a mechanic that fits. However I really like using dice in the game when I can. Not only does it always provide an element of uncertainty, but it also gives a tactile and audible component to task resolution. 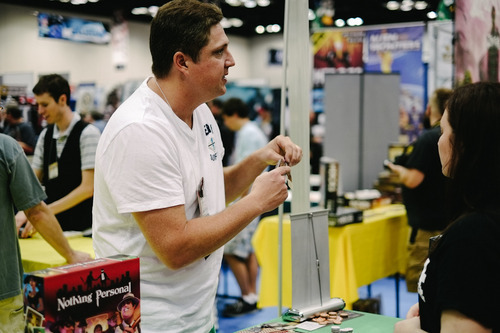 People hardly ever jump up from the table from someone placing a token or from a card flip but they often will roar with laughter or dismay from a bad die roll. Tom: What inspires you? Are there any elements that must be in or not in your games? Stephen: I love seeing the ideas in a new game. It is very much like seeing the meaning in and artist’s artwork. You start to get a glimpse of how they think and why they made the choices they did. Also action movies. I love movies and want to be able to slip into the character’s situation. Lately when I’ve played Nothing Personal, I’ve felt like Don Corleone granting a boon when I do another player a favor. Tom: There’s the role playing coming out. I like that too. Why are you designing games? Tom: I so want to play all of these. I’m a HUGE pulp fan. Operator 5 is one of my favorite characters and reads. And Republic serials are fantastic too. The Adventures of Captain Marvel is super good. I’m running a Day After Ragnarok rpg game right now that is very pulpy. And Spirit of the Century is so fantastic. We need more pulp board and card games. Count me in as a playtester for Pulp Adventures. And can you get me the contact info for those other two guys? Stephen: Absolutely. I’ll be happy to put you in touch. Spirit of the Century is one of my most favorite RPGS. I was disappointed that they took a eurogame approach to “Race to Adventure (the SPOTC boardgame.) It would have made a FANTASTIC co-op adventure game. As an efficiency exercise it really doesn’t capture the spirit of the RPG. You’re pretty active on Twitter and in the design community. How helpful is that to you? Is the community important to you? Stephen: I love people and for me, playing games is about the people with which I interact. Twitter is a great way to connect with people who share your interests. I’ve developed some good friendships with people I only knew through twitter then went on to meet them in real life. Tom: What advice do you have for first time designers? Always make your prototype as close to an actual published game as possible. It helps the publisher visualize the game in finished form. Be flexible, and willing to scale back or redesign parts of your game. Too many times designers are unwilling to change their work. Listen to what the publishers have to say. It is their job to know what works and what doesn’t. When you meet with a publisher, be well prepared. A bad impression will impact your next demo. Look for companies that would be a good fit for your game. Don’t discount small publishers. If you’re going that route, you may need to invest some of your own money to get the game to market. Kickstarter is an option but it is not the *only* option. Tom: That’s all very good advice. Theme or Mechanic. Which comes first for you? Stephen: Theme Always. Though sometimes a good mechanic might suggest a theme. Tom: I’m either. Whatever idea hits first. I’ll integrate a good theme around a neat mechanic or vice versa. Playtesting. How extensive and how long did it take for NP? Stephen: It took about 8 months to playtest, but that was with many many playtesters. We made the game available to anyone who wanted to try it out by putting it up on Dropbox and inviting anyone who wanted to give it a spin. We got all sorts of feedback and were able to round off the rough edges very quickly. Tom: Was it helpful? Did you get a lot of good feedback? Any major changes because of it? Stephen: It was incredibly helpful in almost every aspect. 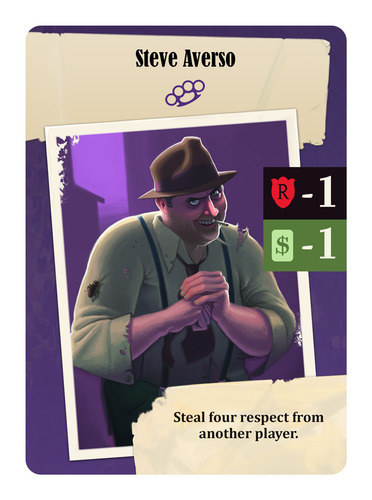 Some of the changes that resulted were putting the turn order on the board, clarifying the way gangsters moved, pruning out bad or unclear cards. Almost everything got tweaked somehow. It was a huge help. My only regret is that we got so much feedback that it was difficult to give credit to everyone. I wanted the rulebook to have one whole page of playtesters but I just couldn’t compile all the names. Stephen: For me a good player is someone who is fun to be around and who I want to play games with no matter how good or bad the game is. Stephen: I believe so. But I also think that the reviewer should qualify how many times he/she played the game. Some games have hidden depth. Others might seem unique that become a lot less appealing after a few plays. Stephen: Mine or someone elses? I have a Dart Gun game (Dart Gun Desperados) that is unpublished. I pull it out at cons and everyone has a great time but it is closer to a toy than a game. As for other people’s games Richard Launius has a superhero game that is really well done. It is a culmination of many of his previous unpublished designs and really captures the feel of superheroes trying to save a city. Tom: My son would love the Dart Gun game. We have almost every Nerf gun available. That superhero game, that’s another one I want to play. I need to interview Richard. What are you currently playing the most? Stephen: Why Nothing Personal of course! But seriously besides demoing, I rarely play the same game twice. 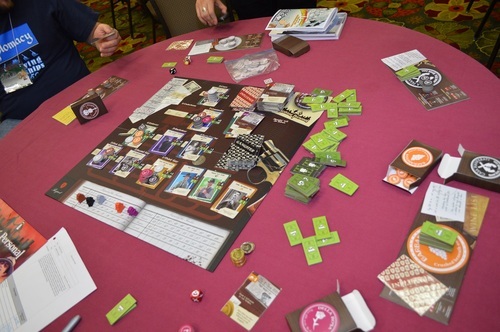 Even games I love, hardly get to the table between playtesting and the huge abundance of games that hit the market. Stephen: I recently played Pixel Lincoln. I really don’t care for deckbuilders but in that game the mechanic fit the theme perfectly. Deckbuilders have lots of redundant actions that you string together which is equally true of many video games. Jason Tagmire did a good job of bringing in other thematic features of videogame play as well. Save points, power ups, combo attacks…It really was well done. Tom: I need to try it. I don’t like most deckbuilders either, except DC Deckbuilding which is awesome. What is next for you? What else is in the queue? Stephen: I want to get Pulp Adventures to beta then start shopping it around at BGGcon. Tom: Ooo that sounds fun. Tom: I’d like to see Anarchy Road. It sounds fun. What are you currently reading? Stephen: I have been chaining Hellboy and BPRD graphics novels. Great books and great illustrations! Tom: Love, love, love Mignola. He’s storytelling is nearly perfect. He does so much without all the clutter detail of a Jim Lee or (ack!) Rob Liefield. I’ve read most of the Hellboy books. I have a Lobster Johnson book next on my list. Need to pick up the BPRD books. What other graphic novels are your favorites? Stephen: Yeah Baby! I read anything and everything. Wtih Hellboy, the heavy shadow he puts on his characters gives a drama that you wouldn’t get in a more detailed images. I read just about anyhting I can get my hands on. I enjoyed the League of Extraordinary Gentleman and the Punisher compendium. Tom: You should pick up The Interman by Jeff Parker. It is FANTASTIC. What was the last good movie you saw? Stephen: I love the movies. 2 guns was the last one I saw and it was excellent. Denzel Washington’s straight guy was a perfect foible for Mark Wahlberg’s wisecracking. The story was good and the action was well done. Tom: Ok, now for the big question. What’s it like to work with Tom Vasel? Stephen: Tom was awesome to work with. I had met him several years ago at Origins and we hit it off. He is a very good natured person and has a great sense of humor. He can be opinionated but he’s open to ideas. We would get together and generate ideas and debate aspects of the game. He had a very clear idea about what kind of experience he wanted NP to deliver. I was very focused on creating an immersive theme. In general, there was only a few points on which we disagreed. My original vision was a darker more serious looking game but in retrospect I’m glad we went with more satirical images (Tom’s idea.) Working long distance was a problem, It was hard to test out gameplay together. In general though I think we made a good team. I hope we can do more games together. I think he is receptive to the idea, but it will always be secondary to the Dice Tower’s media production. Stephen: Thanks for the opportunity. I love meeting people, so if you see me at a con and like a rowdy game, flag me down. I am your man. Thanks so much for being my guest on Go Forth and Game Stephen. It was really cool talking to you. I’m serious about playtesting some games for you, Pulp Adventures in particular. And thank you for joining us for another conversation on Go Forth And Game. 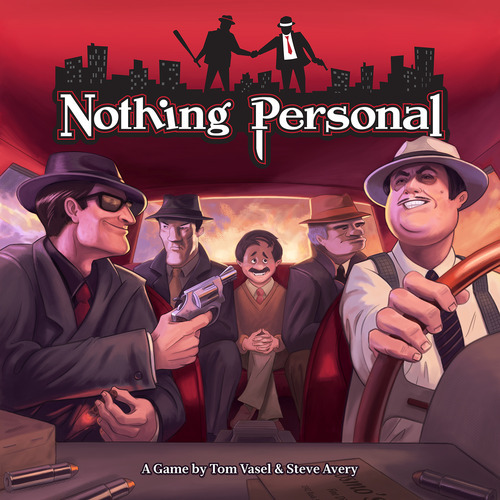 You can pick up a copy of Nothing Personal at your FLGS or your favorite online retailer.